How does Ralph Vacchiano blow this? 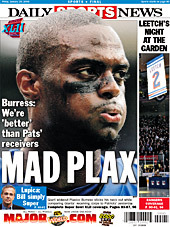 His story was incorrect, Plax had positive things to say about the NE Pats, but they sure must have sold a lot of newspapers. This entry was posted on January 25, 2008 at 9:23 pm and is filed under Uncategorized. You can follow any responses to this entry through the RSS 2.0 feed. You can leave a response, or trackback from your own site.